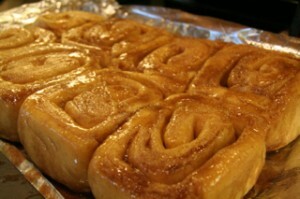 As far back as I can remember, these caramel rolls have graced my mom’s kitchen table on Christmas and Easter mornings. They’re thick caramel rolls that are hearty and delicious. She said she found this in a book many, many years ago and has tweaked it to her liking over the years. She memorized the recipe, so it took a little prying to get all the little details out. My twist to the recipe is to make one and half times the original caramel recipe (quantities reflected below) which makes for even more sweet and gooey goodness. 1) sugar, shortening and HOT water; 2) stir in eggs; 3) stir in yeast; 4) add 2 cups of flour; 5) add salt; 6) remaining flour. As you add the remaining flour it may get to be too much for the mixer, use a big spoon, you may have to eventually kneed in flour if necessary. Add enough flour so the dough is pliable and workable without sticking to your hands, spoons or counter. Form dough into a ball and place into a bowl, cover with a dishtowel and place in a cool oven with the light on. Let the dough rise about twice it’s size (about an hour, but varies, so keep an eye on it after 30 minutes. Next, punch dough down back into a ball cover with dishtowel and let it rise a second time to twice it’s size (about another hour, but watch after 30 minutes). Just before you take the dough out of the oven, mix the caramel mixture ingredients together REALLY WELL, the caramel mixture will be really soft. 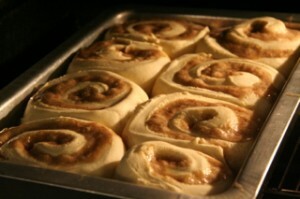 After dough rises a second time, roll dough with a rolling pin into a rectangle shape about a 1/2 inch in thickness. Spread caramel mixture over dough keeping it a 1/2 inch from the edge of dough. Roll up the dough the long way, on the final roll pinch dough to keep it together. Using kitchen scissors, cut into 1 1/2″ rolls. Place into greased pans, I do not recommend air-bake pans – glass or traditional metal baking pans have worked best for me. DO NOT pack the rolls tight. They can touch some, but allow a little room around each roll. Cover pans with a dishtowel and place in a cool oven with light on. Let dough rise until about twice the size (about another hour, but watch after 30 minutes). Take rolls out of oven. Bake 15-20 minutes, look for golden brown color. Take out of oven, flip pan onto cook sheet(s) and enjoy!